PROSECUTOR-GENERAL Ray Goba’s stay at the helm of the National Prosecuting Authority is at risk of being cut short following a decision by the Judicial Service Commission (JSC) to have him face a tribunal. At its meeting on Wednesday morning, the JSC agreed to recommend that President Emmerson Mnangagwa sets up a tribunal to investigate his suitability to hold office. 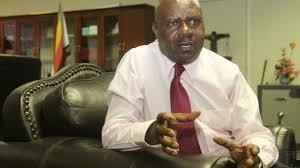 Highly-placed sources said following the meeting, JSC secretary Walter Chikwanha is reported to have informed the Justice ministry of its decision and also wrote to President Emmerson Mnangagwa putting Goba’s troubled stay at the helm of the NPA into fresh turbulence. But Chikwanha last night said the commission’s deliberations were highly-confidential and was therefore unable to comment on Goba’s case. Justice ministry permanent secretary Virginia Mabhiza asked NewsDay to call her after an hour, but her number could not be reached later. Goba, who was appointed under controversial circumstances last year, is accused of failing in his duties to prosecute several corruption cases. He is also accused of putting his office into disrepute by trading insults with lawyers and has allegedly been sneaking out of the country, on certain occasions, without Cabinet authority. Goba told NewsDay he had not yet been informed of the decision of the JSC, although he acknowledged that there was a plot to oust him. “I am one of the most qualified lawyers in the country and any allegations of incompetence against me are shocking,” he said. He called on the people allegedly behind the push to oust him to come out in the open and declare their dislike for him instead of hiding behind false allegations.